One of my favourite north side venues, The Botanist at 17 Willoughby Street, Kirribilli, recently launched their new Spring menu, so I was eager to pay them a visit to sample some of their new dishes. I started the evening with an Elderflower Lychee Martini, made with elderflower liquer, vodka, muddled lychees and lime. This alone was worth the drive over the Bridge. The Botanist has a cosy bar area as you enter, leading into the large open plan restaurant, where you have the choice of small tables or sharing at communal style high tables. 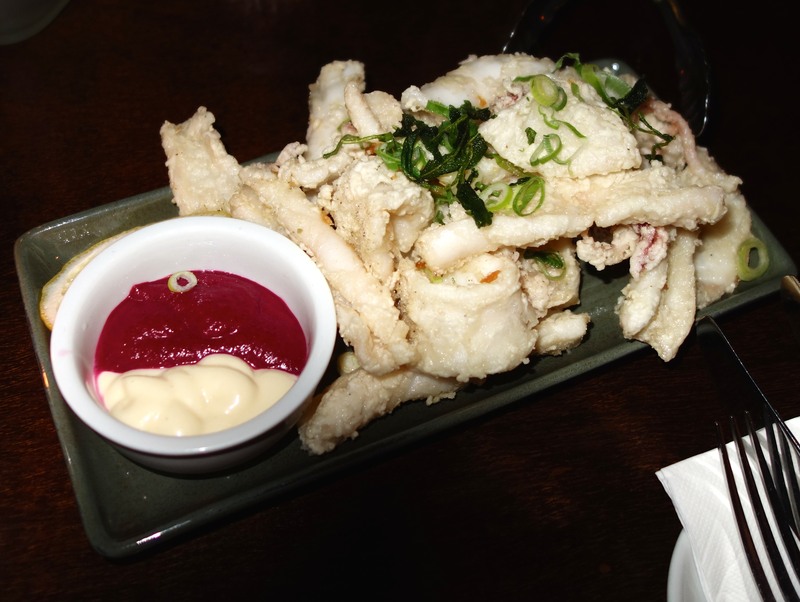 We shared a delicious entrée of calamari in a light batter. It was such a generous portion that we did not need another entrée. 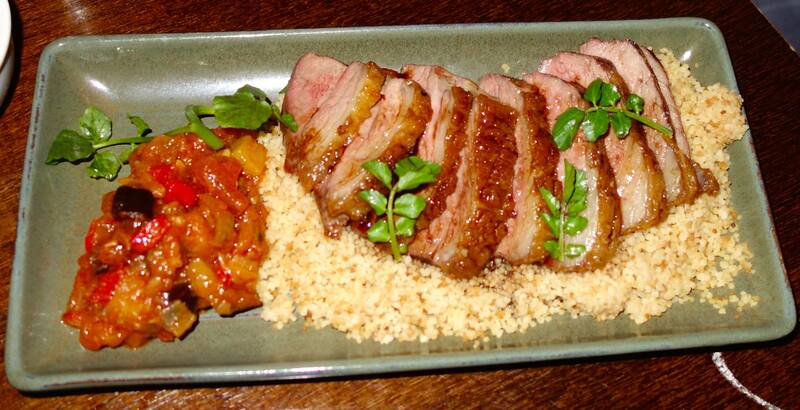 We also decided to share our main courses of Crispy Duck, Pear Chutney & Sesame Caramel and Roast Lamb Rump, Toasted Couscous & Ratatouille. Both dishes were sensational, but I think the tender lamb won out as my favourite. During our meal, we could not help watching all the great pizzas that the waiters carried as they walked past. Next visit I shall have to try one of these. 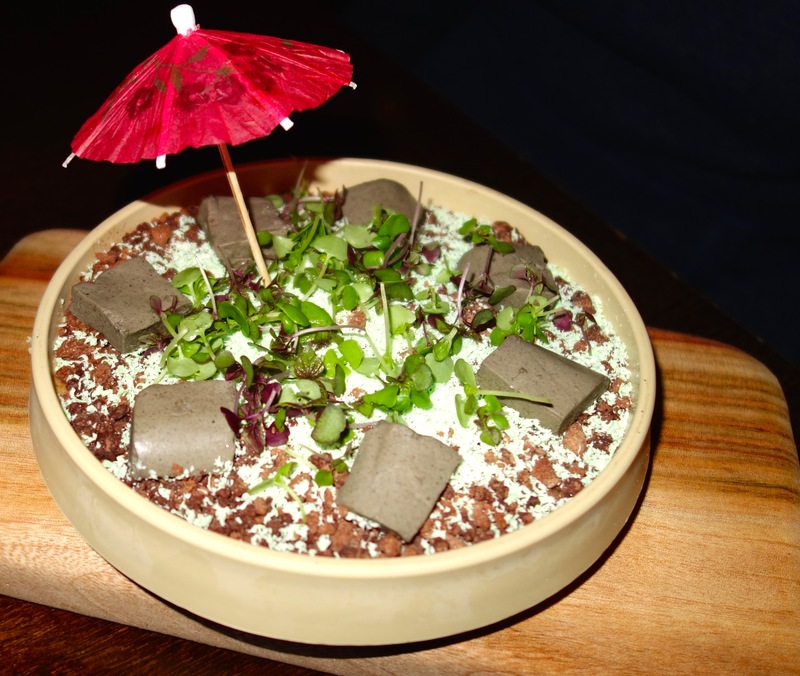 We could not leave without trying their famous dessert, “The Botanist Flower Pot” served to resemble a Flower Pot garden of chocolate soil & herbs. This dessert was like no other and consisted of sponge cake with layers of lemon curd, chocolate crumb, black sesame pannacotta, white chocolate “grass” and micro herbs. I am not sure how they will top this dessert. As I said before, it’s definitely worth the drive over the Bridge. This entry was posted on Saturday, November 1st, 2014 at 5:59 am and is filed under Uncategorized. You can follow any responses to this entry through the RSS 2.0 feed. You can leave a response, or trackback from your own site.